I really can’t answer this question. I can’t answer it because there are far too many things to list and it is impossible to put one thing on the top of that list. My life is beautiful in so many ways and I have had the luck of meeting so many people throughout my life that have been influential and inspirational. I have family that I love with every part of my being. I have a determination inside of me that keeps me moving through every single day. After my first meditation of the day I started thinking about what one word would describe me the best and it did not take me long to come to the conclusion that the word would be determined. With everything I do I have this raging determination that pushes through me and through me and through me. If I set a goal and in my mind I am truly serious about wanting to accomplish it, I will accomplish it no matter what. There will be times when I get sidetracked and it may take me longer than I anticipated to reach my goal but I will get there because when I set a goal it is something that I want so badly. I appreciate having a determination like this in my life and having influences in my life to teach me the importance of determination and hard work. When you work in the field of nonprofit (in most cases) you are introduced to a world very different from what you have always known (for most people-not all people). Nonprofit organizations are mostly set up in high poverty/low-income areas. When I first started working in this field I experienced things I never thought I would first-hand, up close and personal. The things I saw were like images from a movie. I knew this kind of poverty existed and I knew that people struggled, I guess my own personal ignorance (chosen ignorance) never really thought it was that bad. I could not have been more wrong. While working for the two different organizations I spent many days going in and out of homes of teenage mothers. These homes were unlivable and should have been condemned but they weren’t. These homes were filled with filth and any food was scarce and the quality of life was something I could not even imagine. These young mothers struggled with their own lives and were now responsible for the lives of these tiny little people that they brought into the world. The reason I bring up this topic is because being exposed to situations like the one I mentioned above made me appreciate my life on a whole different level. I was able to see what life was really like after I took off the rose-colored glasses. My life became a blessing because I could not imagine living the way that a lot of those people had to live. It strengthened me though. It made me find my calling in life. I don’t care what anyone says, NO ONE should have to live like that. Life comes with stuggles and stresses but everyone deserves a fighting chance and deserves to learn that life does not need to be like that. In the past (I will not lie) there would be people that I encountered that I immediately felt that I was above them…because they were poor or uneducated or had babies when they were teenagers. My way of thinking was such ignorance and I have finally learned that I am above no one. People will not always be able to relate to each other based on their circumstances but that does not mean that either party is better than the other. I have befriended so many people in the last few years of my life that I never thought I would. I befriended these people because of their depth, their wisdom and their goodness. Some of these people did not/do not have two pennies to even rub together but that is something I no longer see…inspiration and influence will never be monetarily or status based for me. If I HAD to answer this question…the one thing I appreciate most about my life is my ability to put myself in another person’s shoes. I may pre-judge or make snap judgments or say or do the wrong thing BUT I will always reflect on my actions and I will ALWAYS remind myself that everyone else’s story and journey is different from my own. There is no way I will ever understand why people think or do as they do because we didn’t have the same lives…we are not clones. 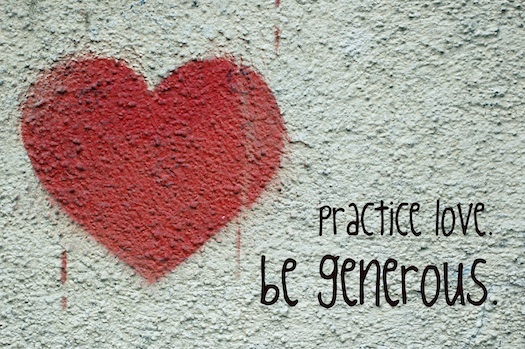 The ability to do this has opened my eyes and has made me practice compassion and be empathetic to other’s situations. Sometimes people scream in silence and all thy want is for someone to hear them or someone to help them or someone to understand them. Everyone is fighting their own fight in this world. I believe in love. I believe in hope. I believe in truth. I believe in faith. I believe that EVERYONE has this incredible power within themselves to make their lives incredible and powerful. Some people just have to work harder to get there….I believe that some people are given this challenge because they need it…they need to prove to themselves that they can do it. This is where I love being part of the process. This is where I love to tell people what they CAN do not what they can’t. I really do believe that love and kindness are simple and I preach and spout it off in so many blog entries. I do this because I believe it is the way to a better life. I appreciate life as a whole because it is this magical place in which we can write and live our own story. We are able to meet people so different from ourselves and learn about other parts of the world from complete strangers. We have all of these endless areas of knowledge and education that are around every corner. Life is truly beautiful if you allow yourself to really see how much is being offered to you. Nice post. There are so many things that I appreciate in my life, I wouldn’t know where to start. I thank God for blessing me so bountifully. Cheers! Amen! I couldn’t agree with you more, Diane. I really appreciate the many great people, such as yourself, who have a heart for helping those less blessed than themselves. I have been homeless and have struggled with an alcohol problem for most of my life. But, now that I am on the road to recovery I am planning on going back to school and get a MS degree in Substance Abuse counseling in order to be better qualified to help others suffering from the same addiction as myself. This is a great idea Diane. That is why my blog is called “Galvanic Jumpings” I am forever jumping from one thing to the next. If more people would actually consider ~thinking~ before speaking; and indeed putting there selves into other’s shoes; it just might make a BIG impact. Just for a moment and that time would make all the difference. I am thankful to have siblings that love me unconditionally.The memories in my heart of my parents who raised me the best they could with the light they had. I still don’t know the answer for this question. I’m practicing on looking into a bright side of thing now. I will comeback to answer to this question later when I finished with my list of good thing in my life. Empathy and determination to REMAIN in empathy with others all around us is such a desirable quality. It is also a necessary quality for all who wish to truly practice agape love in this world.